Copyright © Love, Qilaa. 2013. Powered by Blogger. Whenever you lose a significant someone in your life, it either brings you an impact or cause you nothing. I thought I would be able to handle it after I lose my dearest grandmother. It was still a huge impact for me but yet it's expected. However a year after that, I lose my cousin to pneumonia. Pneumonia for me, is a disease that eventually can be cured if the doctor give correct prescription for drugs and examine the patient carefully. Well, it can also be cured at home too. Few months after my cousin Zira demise, I couldn't even think properly. As if the whole world collapse on me and it shows through my expression. I kept blaming the hospital and doctor for not keeping her in a good care. To add fuel to the fire, I overheard the doctor gave incorrect amount of oxygen to her in the ward. I was pissed because how could the authority let this small thing slipped away and eventually cause death to the patient. 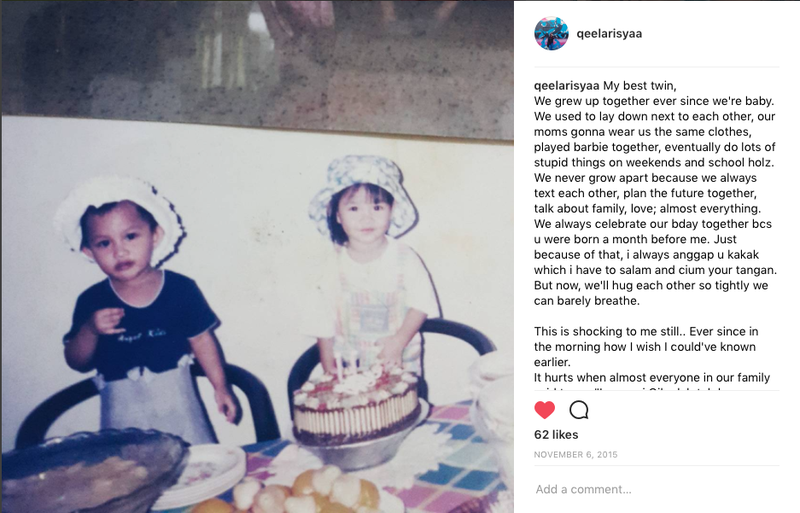 Even until now, I still couldn't help but cry whenever I tell about her death to my friends. With her, I have gone through so much ever since we're young. It makes sense because she's my age and she was born a month before me. 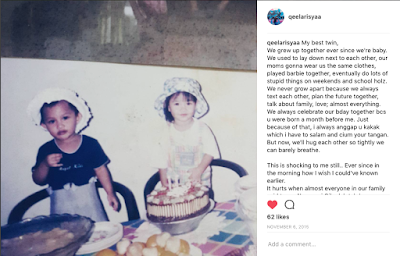 We spent the weekend and school holidays together as our house was just nearby, played those barbie dolls and even shared our secrets together. I never have anything against her because she's been my closest cousin ever since. I remember we planned to live together and go to the same university in Egypt. Well I kinda regret we grew far apart as we get older, but she always embraced me in her arms everytime we met. We kept in touch on how our lives are and talked over coffee hours and hours long. Now that she is not here, although she has always been in my heart and prayers, sometimes I do feel empty, as if I lose a bestfriend. I can't share my success with her, my ups and downs and I can't even tell who I'm crushing on ever since. Today is her birthday, I went to her grave after visiting my late grandmother's. Saddened me to not share my whole life that we're supposed to be since we're small. However, life must go on. Grief has taught me a lot of thing. And it keeps me stronger each and every day. Like I'm building my very own Great Walls of China. I miss you dearly, always.